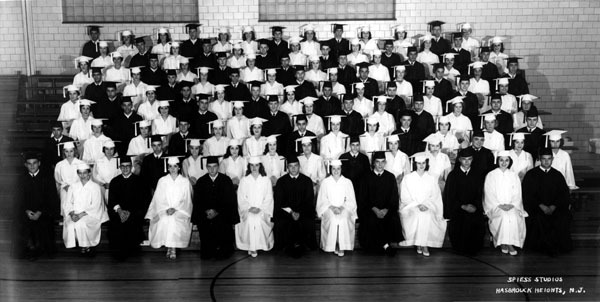 Yes, this June it will be forty years since our 1960 graduation from HHHS! We have a rare opportunity to again meet with classmates and friends to celebrate the four years we spent together; as well as, the last forty years. Plans are being made to hold our reunion at the Fiesta in Wood-Ridge on Aug.12, 2000. Available hotels in Hasbrouck Heights are the Hilton and Holiday Inn. In addition to a Commemorative Yearbook, we can also have a videotape of our celebration. Production costs for the yearbook and the videotape will depend on the amount of people who attend and would purchase a copy. Please advise us of your intentions as to whether on not you will be attending by completing and returning the enclosed reunion form by 2/29/00. We are looking forward to getting together and sharing what has happened during the past 40 years.